Finding out your grandmother is crazy is never a good thing. Especially if you are living with her because your Dad has just died, and you don’t know her very well and she then offers to resurrect her dead son. In case you’re missing him. Poor Cameron could have done with taking note of what it says on page one of The Daemon Parallel by Roy Gill. It might have saved on what he had to go through later. Or not. You never know with loopy grannies. Or is she? Grandma Ives listens to jazz and she uses a cafetiere, so she’s hardly your average, really ancient, cosy granny. She could be cool. Whatever. Grandma Ives shows Cameron that he and she are not quite like others, because they can see a parallel Edinburgh, populated by daemons. And with that they start collecting what they need to revive dead Dad. Cameron meets a werewolf, a poor little used servant girl and a fearsome old woman by the name of Mrs Ferguson. Maybe. And I wouldn’t mind betting that was Jenners department store Roy Gill did such interesting things to. 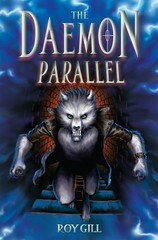 For a werewolf/daemon fantasy with a difference, set in Edinburgh, you can’t do better. In fact, I feel the Edinburgh settings are pretty good, despite me not being an expert. Creepy place, Edinburgh. Avoid Jenners at all costs. And Arthur’s seat. This entry was posted in Authors, Books, Reading, Review and tagged Roy Gill, Scottish Reading. Bookmark the permalink. I agree about Jenners. Too many stairs and dead ends and possibilities of getting lost. But – at least five years ago – it was THE place for cheap eggs. The first-year student went there for the eggs, and was treated as politely by the doorman as if he had shopped properly, in a Jenners-like mode. Thank you for the review, Bookwitch! Glad you enjoyed the novel. I would like to point out the connection between Jenners and the fictitious Aulder & Bartie has been greatly exaggerated. Bad Gran! Roy, you’ve clearly been damaged beyond what’s socially acceptable. It’s Jenners. Don’t try and obscure the matter. Jenners – if you read this, it’s nothing to do with you.